“The time has come to put some stories straight. I’ve waited long enough. I can’t deny it would be good to get some things off my chest. There have been a lot of rumours about me. There have been even more about Dion. 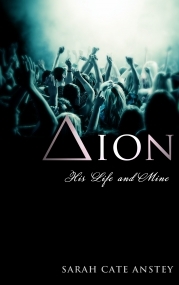 A whole industry sprung up after his death; articles, books, websites ... None of them can explain Dion: Was he a myth? - Or merely a man? Everyone seems to have a ‘true story’ about him. But whose truth is it? It certainly wasn’t his. Now it’s time to reveal Dion’s life … and mine.” Ariadne has had an eventful life. Brought up on the beautiful island of Crete, along with her three siblings; the acclaimed Andro, the condemned Aster and the conniving Phaedra, Ariadne longs for freedom from their tyrannical father, King Minos. The arrival of Theseus, Prince of Athens, offers her an opportunity to escape which leads her to the love of her life, Dionysus, the misunderstood singer of the alternative band, Libertia. Behind the endless press attention surrounding this beautiful grunge-rock god, who is worshipped by young fans, Ariadne discovers a vulnerable, troubled and talented young musician who craves his estranged family’s acceptance. However, the manipulation and misunderstanding, of others, thwart Dion’s desire to use his god-given gifts to make the world happy. Ariadne is forced to watch as tragedy unfolds. In this inventive retelling of the myths of Dionysus and Ariadne, which places them in a timeless, modern world, you see both sides of the story, question fact and fiction and ultimately contemplate our continued fascination with the myth of celebrity. I immensely enjoyed reading Dion: His Life and Mine, this is a truly unique book. The narrator of the story is Ariadne, the main character, looking back on her life. I love this view point as the foreshadowing comments just keep you turning the pages. The characters are all so relatable and you, if not love (as some are just plain mean), then understand all of them. The hyperlinks to newspapers really aid the storyline giving readers helpful background information, often foreshadowing a character's entrance or involvement in the story. This particular aspect I've never seen in any book and really enjoyed. The plot, well I can't tell you about the plot without giving the story away, just be warned this is a beautifully written romantic but tragic tale with a hell of a plot twist at the end. In summary, it's a beautiful modern take on a Greek myth and I recommend that you read it. I loved reading Dion: His Life and Mine. It's Greek Mythology with a modern twist and I loved reading about the characters, Ariadne and Dion in particular. The narration was strong and the story telling really spoke to me as a reader. There's also hyperlinks to help interact with the story. As a young adult (16) I enjoyed this new YA novel. I can't wait to read more of the author's work!